The Navy’s New Robot Looks and Swims Just Like a Shark « Adafruit Industries – Makers, hackers, artists, designers and engineers! The new gizmo, at five feet long and nearly 100 pounds, is about the size of an albacore tuna but looks more like a shark, at least from a distance. 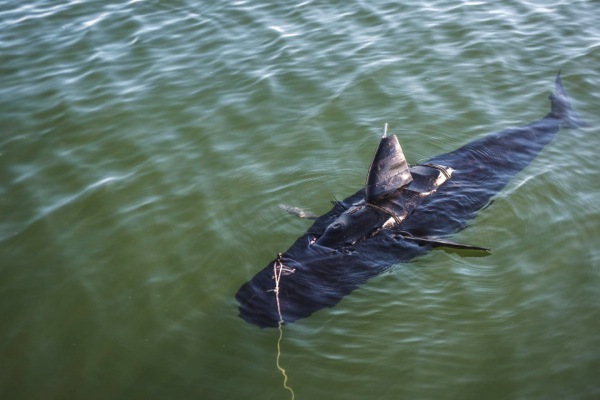 It’s part of an experiment to explore the possibilities of using biomimetic, unmanned, underwater vehicles, and the Navy announced it wrapped up testing of the design last week. The robot uses its tail for propulsion and control, like a real fish. It can operate in water as shallow as 10 inches or dive down to 300 feet. It can be controlled remotely via a 500-foot tether, or swim independently, periodically returning to the surface to communicate. Complete with dorsal and pectoral fins, the robofish is stealthy too: It looks like a fish and moves like a fish, and, like other underwater vehicles, is difficult to spot even if you know to look for it.